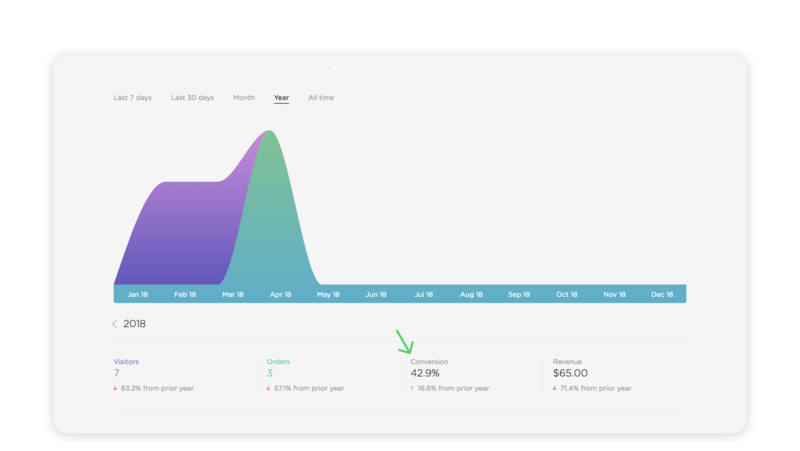 The conversion rate shows you the percentage of people visiting your shop who place orders. Ideally you want this number to be as high as possible as it means more visitors are choosing to buy your products. Got a low conversion rate? Time to strategize ways to turn browsers into paying customers. How about sharing a discount code on social media, updating your product images or store theme, or marking down prices on certain items and labeling them ‘on sale’? Trends help you compare precise changes for each stat over the previous period. The green up arrow and red down arrow will make it easy to see at a glance, so you’ll know exactly what’s working and what’s not. Got a solid bump in sales after you boosted a social media post? Try that on another post and see if you strike gold. Seeing a dip in traffic during a slow season? Maybe it’s time to spice things up with a little sale. Missing some stats? Prior to the launch of our new Dashboard in February 2017, visitor stats weren’t tracked for accounts on our free Gold plan, and they were only retained in the dashboard for accounts on a paid plan after mid-2015. These missing stats make it so we can’t always calculate a conversion rate, so you’ll see a dash instead of a percentage if the rate can’t be determined. The good news is all accounts, both free and paid, now have access to the same Dashboard stats going forward! Click on the time frame you want to view under the graph. 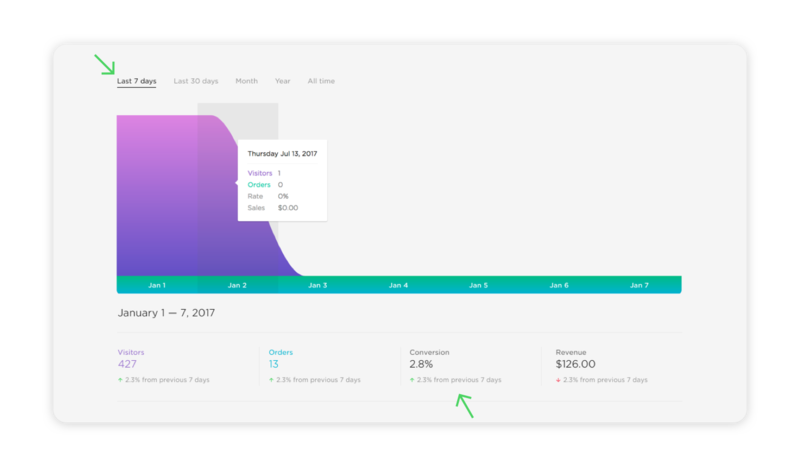 The conversion rate for that period will be displayed below the graph. Hover over any stat that has an up or down arrow to view the stat’s changes compared to the previous time period.